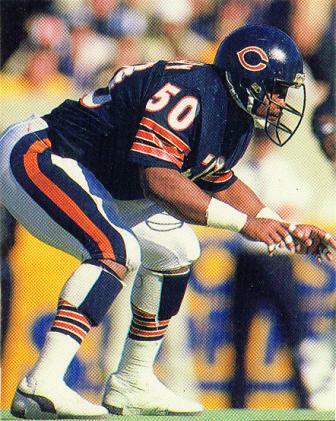 Singletary was taken by the Bears in the second round of the 1981 NFL draft and moved into the starting middle linebacker position during his rookie year. While there initially was concern about his lack of ideal size, by his third season in 1983 he was named to the Pro Bowl for the first of 10 straight years and was a consensus first-team All-NFL selection in 1984. Initially taken out of games in passing situations, he became adept at pass coverage as well as defense against the run. Singletary’s ability to dominate the middle of the field was a key component in defensive coordinator Buddy Ryan’s stifling 46 defense. Bears went 15-1 to finish first in the NFC Central with the NFL’s best record while leading the league in fewest yards allowed overall (4135), fewest rushing yards (1319), fewest points (198), and most passes intercepted (34). Won NFC Divisional playoff over New York Giants (21-0), NFC Championship over Los Angeles Rams (24-0), and Super Bowl over New England Patriots (46-10). Singletary continued to star in the middle of Chicago’s defense, which ranked at the top of the league for the third straight year in 1986, playing for another seven seasons and going to the Pro Bowl after each while also continuing to be a consensus first-team All-NFL selection in five of the next six years (a total of seven times overall). He was also again named NFL Defensive Player of the Year by the Associated Press in 1988. Singletary appeared in 172 regular season games and 12 more in the postseason on his way to induction into the Pro Football Hall of Fame, Class of 1998.